Roaming Safari Walk-A-Bout Walker is rated 4.2 out of 5 by 18. Who’s the king of the jungle? Your wild one! 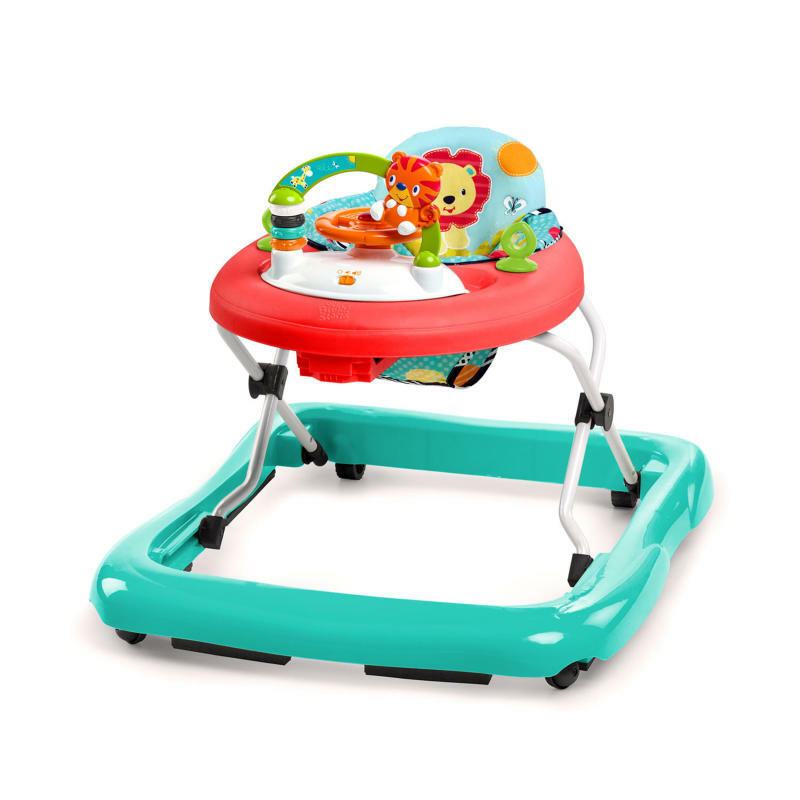 With this safari baby walker, every tip-toed journey is tip-top adventure. The activity walker from Bright Starts is roooooooooaring with toys, sounds, lights and fun. Just what every adventurer needs. The best part? You can remove the toy station and use it on the floor for more playtime. Who doesn’t love a two-for-one! Before your baby can walk on her own (enjoy these moments while you can, mom and dad) an infant walker encourages her growing independence while keeping her safe. Watch as your baby’s imagination turns the whole house into an exotic jungle. Get ready for lions and tigers and tots, oh my! Rated 2 out of 5 by Rain42 from It does not disassemble to go back in the box. This never kept the attention of our granddaughter. She played with it more while pushing it than sitting or standing in it. Our granddaughter is now walking and does not need a walker. When I tried to put it back in the box for easy storage, I ran into issues. After trying to take the toy off of the white base, I checked the internet for disassembly directions. There were none, so I called customer service. After waiting on hold to be connected to a person for over 10 minutes, I was informed that once the two pieces are snapped together, there is no way to take them apart. So once the walk-a-bout is no longer needed, it cannot fit back in the box for easy storage. Rated 3 out of 5 by Ejself from Need help getting the toy detached The electronic toy isn't working and I need to check and see if my son put the batteries in right. I can not get it to detach. I've squeezed the tabs until I've broken my nails but it won't budge. Does anyone have any tips? Rated 5 out of 5 by ATL008 from Great quality Walker is great quality - our little one loved the fun music and quickly learned how to play with each of the interactive featues. Also greatly appreciate that you can easily adjust for height. Seems like it can grow with you easily or fit different ages and sizes. Rated 4 out of 5 by Lcwatson from Baby loves it! I didn't think I would be a fan of a walker, but my son loves it! It was simple to assemble and has plenty of visual features that keeps baby happy! Rated 5 out of 5 by Tc1208 from Tons of fun My son gets so excited to walk around in this! He Loves the freedom to move but having his toys follow him around too. The colors are fun and get his attention. On top of that, he wears himself out so much he'll fall asleep in it sometimes. Love this walker! Rated 3 out of 5 by jbpri from Walking Made Fun The Roaming Safari Walk-A-Bout is bright and colorful. I loved the jungle theme and turquoise and red colors. I had difficulty properly installing the seat. I assumed it was secure because I heard a click, but in actuality it wasn't. After flipping the walk-a-bout over and making sure all latches were secure, the seat remained firmly attached. My one-year old has enjoyed being in the seat. The toys are entertaining and the ability to walk all over our house has been so much fun for him. I think this walker is also improving his walking skills.